I now have patty pan squash and carrots coming out of my ears! It seems like every dinner starts with a cutting board like the one below. My first night back to work after the California trip, I returned from Philadelphia and just stared at the produce in my kitchen, trying to come up with something new for dinner. 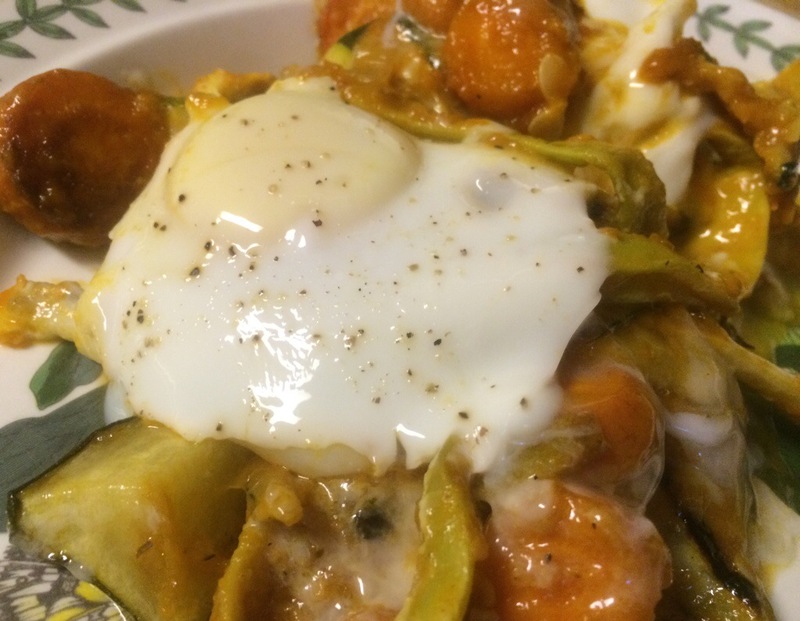 I started with the thought of a vegetable hash with eggs…that’s not new. Then I remembered that my sister-in-law had made some tomato sauce with my tomatoes while I was gone, and there was some left in the fridge. I decided to make a rift on shakshouka, a dish of eggs poached in a sauce of tomatoes, chili peppers, and onions. 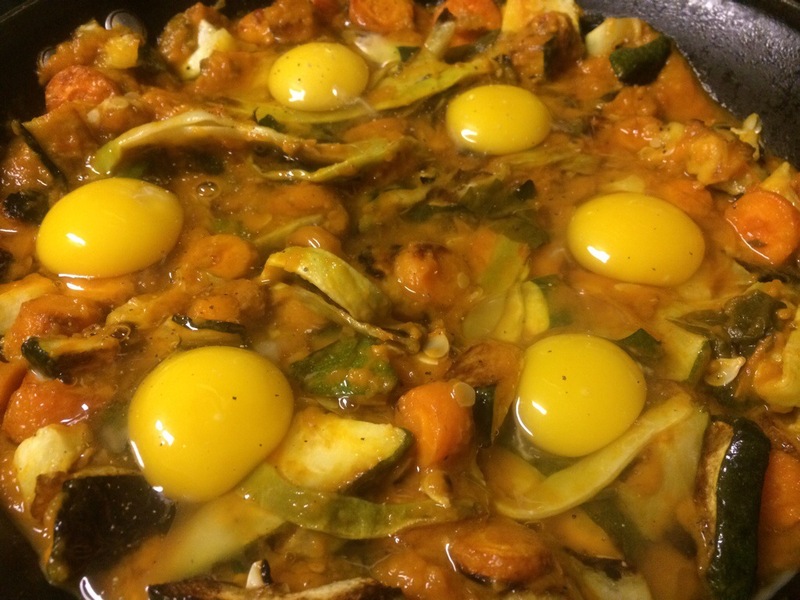 I decided to roast the squash and carrots, along with some yellow beans, then cook that in the tomato sauce and cook the eggs on top. It turned out so tasty, that even though the portions were huge, we devoured it. I especially liked mine with a little sriracha. Another thing we learned while making this, was that roasted beans are delicious! We could have eaten them all while waiting for the other veggies to cook. Prepare the green beans for roasting by placing them on a baking sheet, tossing with 1 Tbsp olive oil, salt and pepper. Roast the green beans by turning every 5 min for about 15 min, or until browned. Roast the carrots and zucchini by turning every 10 minutes for about 30 min, or until browned. Make wells and crack the eggs into the wells. Cover and cook over medium-high heat for 5 – 8 minutes, until eggs are the desired doneness.Enjoy! Serves 4 with large portions.